Island hopping from Rafina: where does the ferry go? Situated in the eastern suburbs of Attica, north of Athens, Rafina is a charming town and port, with developed tourist infrastructure. This beautiful town resembles to a small island with its scenic beachfront lined up with cafes, bars and fish taverns. As Rafina is the second largest port in Attica, after Pireaus, and very close to the international airport of Athens, it is a convenient gate to the Cyclades and other islands, offering very frequent ferry schedules. Visitors can explore many beautiful destinations with island hopping from Rafina, including Andros, Tinos, Naxos, Paros, Mykonos, Santorini and more. Trips with the ferry last from 2 to 5 hours and give an opportunity to all those who need to escape from Athens. Here are the most popular itineraries for island hopping from Rafina. Highly recommended is island hopping from Rafina to Andros and Tinos. This is a year round ferry route and the ferry ride takes only two hours until Andros, making a stop at Andros first and then heading to Tinos. The ferry to Tinos from Rafina is about 2-3 hours. Andros is a verdant island, characterized by long naval history and rich culture. 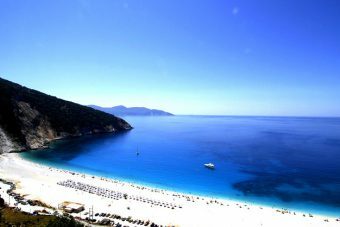 Its highlights include the main village and capital Chora, famous for the elegant architecture, historical mansions and museums, as well as several sandy beaches, such as Golden Beach, Batsi and Agios Petros. 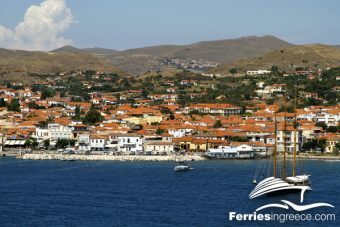 The ferry continues to the lovely island of Tinos, a quiet destination ideal for relaxing family holidays. Tinos is largely visited for the Church of Panagia, which is said to be miracle working, but the island also has stunning sandy beaches and nice villages, like Agios Ioannis Porto. Another ferry itinerary from Rafina, which runs only in summer season, travels to Mykonos and Santorini, the two most popular islands of Greece. About 4 hours by ferry from Rafina, Mykonos is the first stop, a lively island with glamorous atmosphere and crazy nightlife. Mykonos distinguishes for its wonderful sandy beaches with crystal waters and the wild parties organized by beach bars or the clubs in Town. Visit the popular beaches of Super Paradise, Paradise and Kalo Livadi, and watch the magnificent sunset from the quarter of Little Venice in Mykonos Town. After Mykonos, enjoy a romantic holiday in Santorini, overlooking the sunset from hilltop villages, such as Oia and Fira. This is a great destination for couples and receives thousands of visitors every summer. 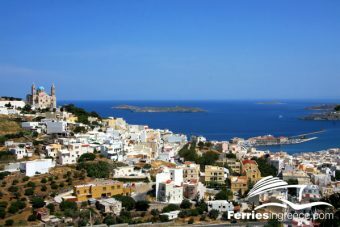 The cosmopolitan islands of Naxos and Paros can also be accessed by island hopping from Rafina port. In summer, there are many daily ferries connecting these two islands with the mainland. The green island of Naxos, the largest of the Cyclades, offers an excellent family or romantic retreat. The best beaches, famous for their golden sand and deep blue waters, are Plaka, Agios Prokopios, Agia Anna and Mikri Vigla, also perfect for windsurfing and kitesurfing. Do not miss the scenic main town to enjoy excellent dining or a late night drink. The ferries need about 4 hours from Rafina to Naxos. In Paros, experience welcoming Greek hospitality and discover some exciting nightlife options, lively and chic, although not as wild as the ones in Mykonos. Paros has an amazing coastline with popular beaches, such as Golden beach, Kolymbithres, Santa Maria and others, many beach bars and restaurants, and traditional villages with white washed houses and paved streets. Find all available routes here!